Enjoy the plush relief of this Springwall Fairweather 3 Euro-top twin mattress set. Surrounded by a durable wire edge, over 500 continuous coil springs work together to keep your spine in pain-relieving alignment. Meanwhile, egg-crate-shaped foam takes the pressure off your tender muscles. Each foam layer is made with soy oil so you can sleep peacefully knowing your bed is both environmentally friendly and durable. 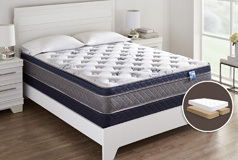 560 Springwall Continuous Coil This mattress contains 560 continuous coils inside to provide firm, even support so you can enjoy a comfortable sleep. SpringWALL Edge System A thicker, more durable wire surrounds the mattress to help extend the life of the sleep surface and offer a comfortable sitting edge. 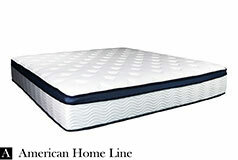 Insulator Pad This cozy layer provides additional cushioning while you rest. 1.5-Inch Convoluted Bio Comfort Foam Made from soy-based oil, this highly durable foam features an egg crate shape for improved comfort and support. 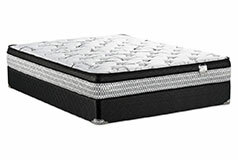 0.5-Inch Bio Comfort Foam Springwall's bio comfort foam layer is made from soy-based oils to give you an environmentally friendly and rejuvenating sleep space. Tack and Jump Quilted to 0.25-Inch Gel Foam and 20-Ounce Hollow Fibre Tack-and-jump quilting uses hundreds of needles to join 0.25 inches of super-soft gel foam with a sheet of 20-ounce hollow fibre. 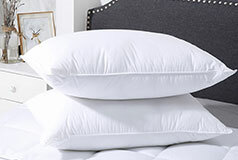 This creates a luxurious cushioning layer with a softer-feeling surface.